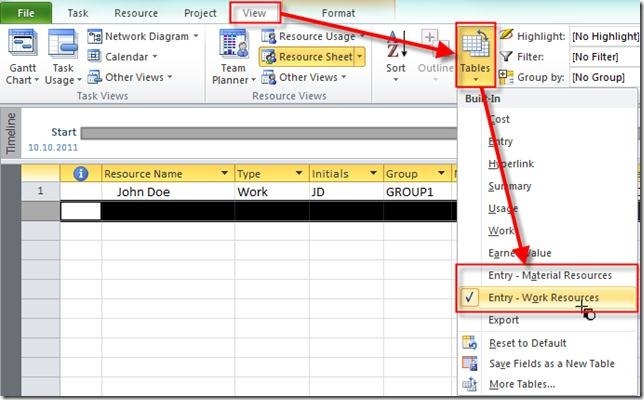 ← Setting Up Resources in MS PROJECT 2010! Budget Resource, and Detailed Resource information! Different Resources Types in MS PROJECT 2010 and what do you have to know about them! What are RESOURCES in MS PROJECT 2010. Those are people (human resources), equipment (machines), material (bricks, oil, butter,..) and cost needed to perform the Task(s), and to reach the Project Goals and Objectives. 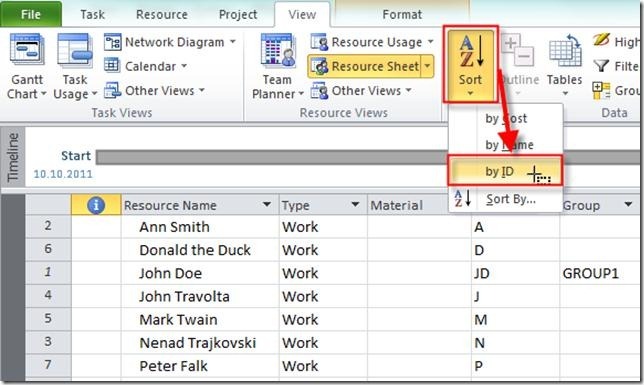 There are three types of Resources in MS PROJECT 2010: Work Resources, Material Resources i Cost Resources. Material Resources are consumables like bricks, oil, concrete etc., and they are time independent. Cost Resources are time independent resources, like Airplane tickets. If you are traveling from Zagreb, Croatia (my hometown) to Amsterdam it will cost you, approx. 300€, no matter how long will you travel (1 hour or 1,5 hours). If you are traveling from LA to Boston the price will be different. Those type of Resources is needed in your Project to analyze your costs (from my example, how much money did we spend for the travelling with airplanes). Material: If resource type is Material Resources in this field you are putting measure unit (like tons, meters, pieces, etc.). This field is disabled for other resource types. 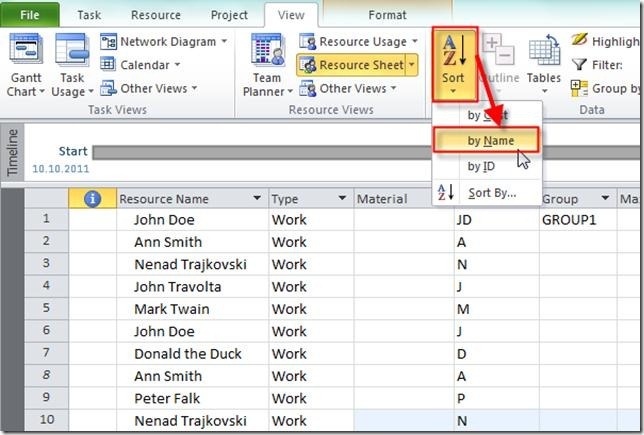 Initials: You can put initials for the Resource (like NT for Nenad Trajkovski), but you can use this field for other purposes. I will write about this in one of my next posts. Max: This field is only enabled for the Work Resources. You can put 10%, 50%, 100%, 300%, or any number you want (except 0%). This field is of big, I will tell GREAT importance, and it is used (with other parameters) to calculate the WORK FIELD. It will be explained very briefly in my post where I am going to write about assigning resources to the tasks. For now, just remember that if you are put, for example 100%, for the Max, it means that that Resource is 100% available for your Project. Standard Rate: This is Standard fee (MONEY) for the resource. You can put that fee like, for example 100/hour, /day etc. This is true only for Work type. If, for example, resource has $50/hour, and it will work 5 days and 8hours per day, cost for this resource will be 40 hours X $50 = $2.000. 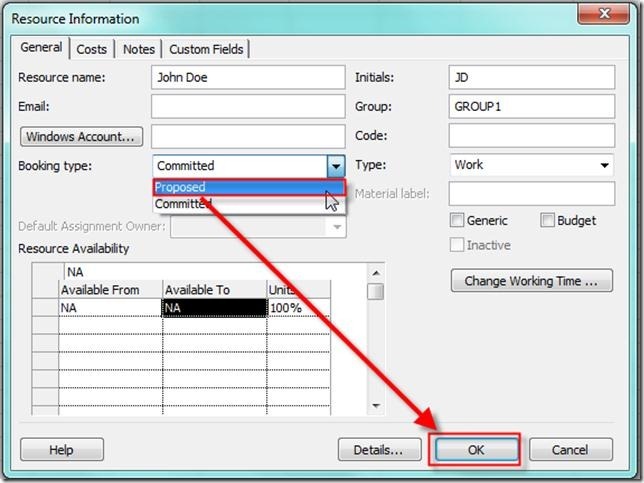 This field is disabled for the Cost type, because for this type of resources you will put the exact cost when you will assign that cost to the Task. Cost/Use: That is also known as a Setup fee. For example, if you have Resource named: Nenad – the plumber, and it has $100/hour as a standard fee, and he is charging his travel to your home $50, no matter how long he is going to drive, than you will put $50 in that field. 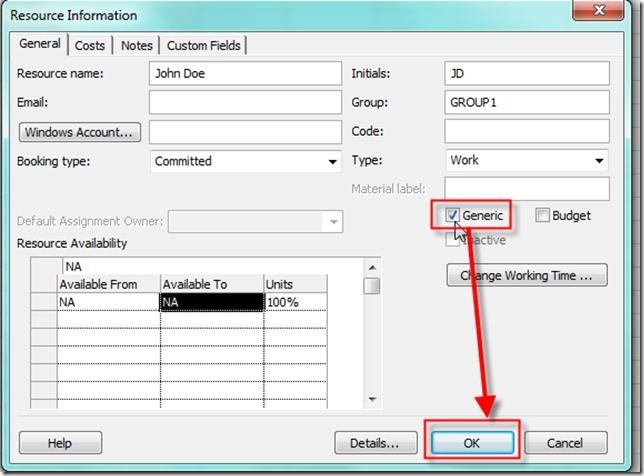 This field is disabled for the Cost type of resource, because it is seamless. Accrue at: You have three choices: Prorated, Start i End. In this field you will decide how will costs be charged, e.g. when will you charge those costs!. Prorated means that if, for example, cost for the task is $1.000, and only 20% of the task is finished, it will be $200 charged! Start means that this $1.000 will be charged as soon as the task begins, and End means that this $1.000 will be charged not before the tasks ends. Base Calendar: You are assigning any specific calendar for the resource if you have one. I wrote about that in one of my previous posts. Obviously, this field is enabled only for Work type. Code: If you have any specific code for you resource put it here. Until my next post, best Regards! This entry was posted in MICROSOFT PROJECT, Microsoft PRoject 2010, MS PROJECT 2010, PMI, PRoject Management and tagged MS PROJECT, MS PROJECT - Resources, MS PROJECT 2010, Project Management, Project Managementm. Bookmark the permalink. 40 Responses to Different Resources Types in MS PROJECT 2010 and what do you have to know about them! I am using MSPS 2013, so I have to create a plan for application development project. what is the task type I have to select?? Well, I do not know. There is no magic answer on that. It depend on how you estimate your Tasks. Very useful information. I am wondering how you would manage a rate increase in MS Project halfway through the project that is not retroactive. If I change the $/hr for a resource, it re-calculates the total cost for the project with the new rates. Which is not reality. I wonder if you already tackled this type of problem in one of your projects and how you went about solving it. I work for a company that hires out staging equipment and most warehousing / hire software is extremely complex, powerful and expensive! I am simply trying to use MSP to tell me when I have over allocated a particular type of hire stock. My problem is that I have set up each type of equipment, for example an 8′ x 4′ stage deck, as work resource. Lets say I have 10, so I have set max to 10 (1000%), available 24 hours etc.. Everything works well if I book the decks out for 24 hour blocks- it shows over allocation if I book out 11. However, If I book the decks out for 12 hours- say Morning set up & evening pack up, I can over allocate them up to 20. Its as if MSP considers that I have 10 decks available for 24 hours and therefore 240 hours (14,400 min) of decks to allocate each day! I need MSP to handle the resource per unit rather than per minute. I have looked plenty of places and cannot find an answer. Can you please help me? Thanks mate, very much appreciated! I don’t understand your PToblem. What you explained is exactly how MD Project works! If you have a generic resource avaliable 24 hour per day, and you assign it onlly 12 hours per day, than another 12 hous are avaliable, and that resource would not be over allocated! So if I only have 10 units to hire out and I book them out for 12 hours, say 9am to 9pm, I want the overallocation error to poop up when I assign 11 units. At the moment, MSP will let me hire out 20 units for 12 hours even though I only have 10 in stock. If I were to hire them out for only 6 hours MSP would let me allocate 40! I need MSP to warn me when I have allocated more than 10 units regardless of how long they are out for. Hope this clears it up and I hope there is a way! I am wondering how to assign work costs a different way than rate/hour or rate/day like you said. What if we’re using a subcontractor that is working by contract for example cost plus fee payment. They are getting paid the cost of the project plus an additional predetermined fee. Or some similar contract payment method. Should I change the subcontractors into a materials resource or something ? I’ll write a post about that next week! Using a cost resource could help you solve your problem. The cost resource is a very flexible resource because you can re-use the same resource name and assign different cost values to it. The only problem with the cost resource is that it does not add to your Earned Value (EVM) calculations in MS Projects because it is normally used for non-value adding costs such as travelling and accomodation. If you would like to have the costs forming part of the EVM calculations then you must use the material resource. It seems that MSP 2010 does not generate EVM values such as SPI and CPI if you assign only a “cost resource type” to a task. How can I overcome this if I want to continue only using cost resource types for example a single cost for a milestone or deliverable? It seem so! I’ll examine this and get back to you! I can’t find anywhere the answer: how to allocate a machine resources (eg. 2 machines) among worker (eg. 3 workers). Machines operate the same amount of time as workers, but actualy they don’t affect the duration of the task. as far as I understand, you have, for example, 3 workers and 2 machines onn the sam task. Just assigna workers (marked as work resources in resource sheet), and machines (marked as mateiral resource) to the same task, and that’s it. If you need any further explanation, do not hesitate to ask. No, actualy let’s supose a very simple example: we have 3 tasks, 3 workers and 2 machines, so 1 worker can’t work as there’s no machine to work on. And how to logicaly corelate somehow machine to worker. there is no way to do this. What I mean is that you can’t assign one resource to another! You must see when machine is available, and then assign worker with machine! I will, but please be more Specific! What is exactly what you want to know? Suppose that you have two subcontractors : SUBA and SUBB. And you have a bricks and concrete from both of them. You can name them SUBA-Bricks, SUBB-Bricks, SUBA-concrete, SUBB-concrete. And yes, you should be very careful to not mix them! I was wondering if this could be done by puting the subcontractor under the “group” option. Normally, this would allow me to identify directly the total costs of the ressources linked to the group (subcontractor). If I decide to apply your option, I am affraid that I would lose the “automatic” option of identifying all the costs related to one sole company, as the ressource name would be SUBB-bricks, SUBB-concrete. Thank you again for your time and help. You can not group them Just like that. You should do as I told you and then in a Group field put something like: VENDOR A, VENDOR B, etc. and then filter them by that! The best Advice is to take on of existing reports, copy it, add fields that you need and that’s it. But I do not think that it is possible in a way you want it! MS PROJECT PRO 2010 is poor with reports! What type of report do you want? i am facing a problem when i assign resources to the task they become overallocated and cost rise abruptly. how i can find the exact cost. Apply the cost table, and you will find the exacr costs! when you do thata, you can apply resource or task usage view! nice article on types resources in MSP2010. Would like to know how such resource utilization, impact on budgeting. (% utilization of resources and budgeting of projects), in your articles. Please find my posts about that. I wrote about budgets! I precisely needed to appreciate you once more. I do not know the things I would have created in the absence of those points provided by you over such question. It truly was a very frustrating issue for me personally, nevertheless being able to see the very specialized approach you resolved that made me to jump for happiness. I am thankful for your work as well as expect you know what a powerful job you are undertaking instructing some other people all through your webpage. I know that you have never met all of us. I am brainstorming a research paper for school and I am currently following several blogs for review. I believe the knowledge written in your article is actually superb. I could in all probability use the data if you do not mind. Thank you! Use the data, I don’t mind!